My fellow Californians, declare your independence. Skip your community’s local parade and fireworks show. And head to San Diego, where the truth will be self-evident: No place in California celebrates the Fourth of July half as well as San Diego. What place could possibly top such a Fourth? Last year on the Fourth, my wife and kids and I went down to San Diego to visit cousins, and by the end of the holiday the revelation had hit with the force of a cruise missile: San Diego has America’s Finest Fourth of July. It’s not just the fireworks show right there in the harbor, even though it’s the biggest show on the West Coast, televised live not only in San Diego but also in Los Angeles, Santa Barbara, Palm Springs, and even northern Mexico. And it’s not just the cool breezes that make San Diego one of the most pleasant places in California to spend a hot July day. It’s not just the assets San Diego offers visitors, from the zoo to the Gaslamp District to the museum treasures of Balboa Park. It’s not just that the San Diego County Fair is up and running every Fourth along the glorious coastline in Del Mar. And it’s not just that San Diego offers baseball and tasty hot dogs in the state’s most comfortable sports venue, Petco Park, (or that this weekend the Padres are at home to play the Yankees). San Diego’s Independence Day advantage runs deeper. It is the most American of California cities. It also may be our most patriotic pueblo. If you attempted a census of American flags, San Diego would win hands-down; look in any direction in the city and you’re all but certain to see the stars and stripes in some form or fashion. The Bay Area and Los Angeles are technological and cultural oddballs, proudly out of step with reality, not to mention the rest of the country … San Diego County … represents our middle, and the closest approximation to the American norm that California can offer. Before you quibble with my claims about San Diego’s Americanness, consider its competitors: the Bay Area and Los Angeles are technological and cultural oddballs, proudly out of step with reality, not to mention the rest of the country. And our inland cities swing too far country and right of the mainstream. San Diego County, with fairly equal numbers of Democrats and Republicans (and lots of independents), represents our middle, and the closest approximation to the American norm that California can offer. In other ways, San Diego is abnormally American. While the military is no longer the engine that drives the city, the visibility of the armed forces, via ships and military installations and veterans, offers constant reminders of America and its history that you don’t get at the same pace in the rest of the state. Being on an international border plays a role too. San Diegans, particularly the hundreds of thousands who cross the border at Otay Mesa or San Ysidro (or use the Tijuana airport), must pony up proof of their U.S. citizenship more often than most Californians. Sandy Purdon, a marina owner, Marine veteran, and longtime San Diego mover-and-shaker, was building a home out on Point Loma more than 16 years ago when it hit him: San Diego’s downtown waterfront sits at center stage of a massive natural amphitheater created by Mission Hills to the north, the hills east of downtown, the hills of Point Loma to the west, and the hills to the south on the Mexican side of the border. So why not fill it with a fireworks show that would draw big crowds over the July 4 holiday? The Port of San Diego and port-affiliated businesses agreed to sponsor it, with proceeds going to the Armed Services YMCA, a charity supporting military families. The show started small in 2001, and there was a famous mishap in 2012, when all 18 minutes worth of pyrotechnics fired off in about 30 seconds. But the show has grown into a reliable giant, with four barges in the harbor now serving as staging ground. The effect is powerful, like four simultaneous Rose Bowl-sized fireworks displays with an impressive water feature thrown in. And it’s possible more spectacle and more barges could be added in the years ahead. Last year, my cousins took us out to the old Point Loma Lighthouse, which is part of the national monument named after the Portuguese explorer Juan Rodríguez Cabrillo, the first European to navigate the California coast. The site, at the end of a peninsula, offered a stunning vista encompassing ocean, Mexico, downtown, harbor, and North County. 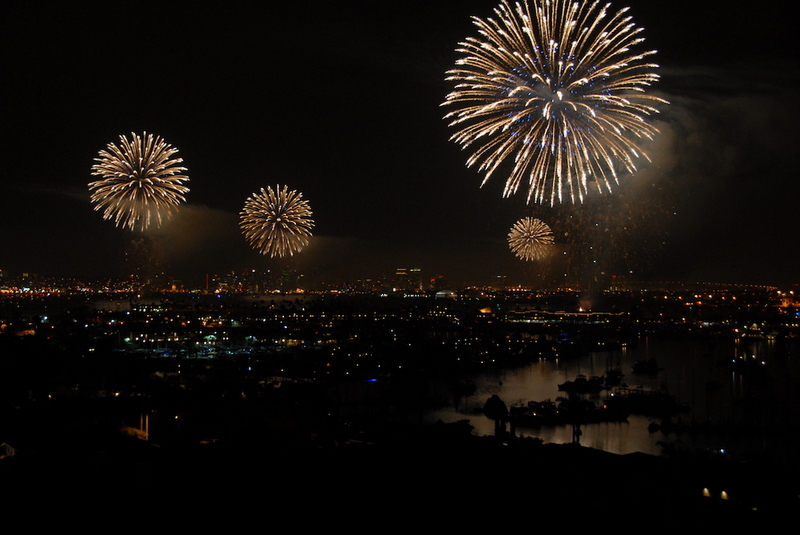 From that vantage point, we could see smaller fireworks shows from different local communities around San Diego, as well as the shows at Sea World and the fair to the north. Then the main show, called Big Bay Boom, exploded, bigger and more beautiful than any fireworks I’ve ever seen. The majesty of the lights and the setting, at the southwestern edge of our country, left me with nothing to say except three words, uttered without irony: God Bless America. *Photo courtesy of Port of San Diego/Flickr. Connecting California, fireworks, Fourth of July, patriotism, San Diego, U.S., western U.S.